This small room, which was a sleeping area, has not been restored but displays the restoration process. 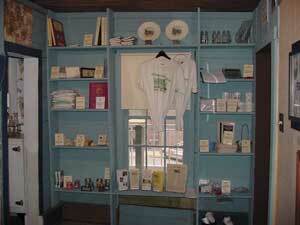 This room also provides space for our small gift shop. 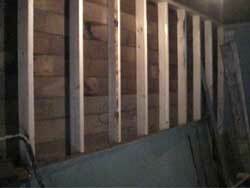 The second story log wall is bared, prior to putting on plywood for the display of building artifacts. 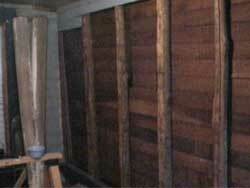 A stud wall was replaced between the Gallery and the 1941 Sleeping Room. It had been removed in the late 40s. 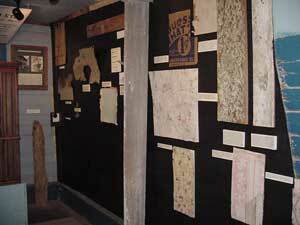 Display wall is under construction which features various wallcovering through the years, among other things. Opposite the wallcovering display wall is a timeline of the restoration and pictures of the building in different periods, which are backlit. Information about the various owners will be presented and will soon feature a looped video of the restoration process. 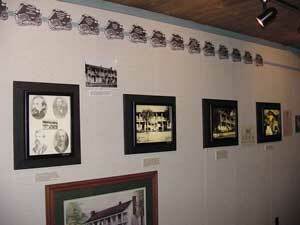 The outside wall in the Restoration Gallery features a variety of souvenirs of a visit to the Old Stagecoach Stop, including marbles, cups, notecards, and the Old Stagecoach Stop Cookbook. For those interested in more information, a 135 page book about the building in the 19th century and concurrent Pulaski County history is available. A souvenir video, "Doorways to the Past", is also for sale.